A 1932 US Benchmark in Bryson City, North Carolina. 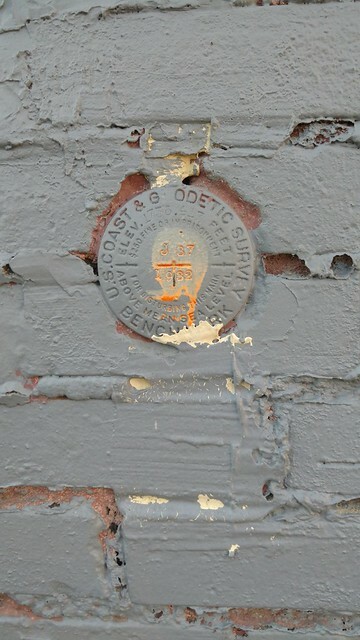 AT BRYSON, SWAIN COUNTY, AT THE NORTH END OF EVERETT STREET, IN THE SOUTHEAST CORNER OF A BRICK BUILDING OWNED BY W.A. FRANKLIN, AND 3-1/2 FEET ABOVE GROUND, AND SET VERTICALLY. NOTE-- EVERETT STREET HAS BEEN EXTENDED NORTH FOR PLUS OR MINUS 200 FEET, THEREFORE TABLET IS PLUS OR MINUS 200 FEET SOUTH OF NORTH END OF EVERETT STREET, PLUS OR MINUS 200 FEET NORTHWEST OF SOUTHERN RAILROAD DEPOT. As with all Virtual geocaching and Benchmarking, a photo proof of visit is required.